The new Sloan Hybrid Urinal with Jetrinse technology is virtually a waterfree urinal that does an automatic ‘service purge’ which flushes up to one gallon of water once every 72 hours. This hybrid model allows you to still save thousands of gallons of water a year and also easily keep your drain lines clean, hygienic, and clog free, while also keeping your restrooms odor free! We like to practice what we preach at Equiparts. So, we updated our facilities with the new Hybrid Urinal from Sloan! We promote sustainability at Equiparts and hope to become more energy and water efficient as our manufacturers continue to create innovative and environmentally friendly fixtures and products. (We also have a bottle filler station in our employee kitchen that has saved over 12,000 plastic bottles!) We are excited to now have a Sloan Hybrid Urinal which will help us save thousands of gallons of water each year. 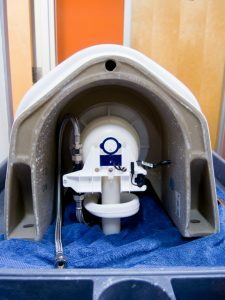 According to Chris Pofi, Operations Manager at Equiparts, the Sloan Hybrid Urinal with Jetrinse Technology was very easy to install at Equiparts. He says that it only took them about 30 minutes to install in the Equiparts’ restroom. 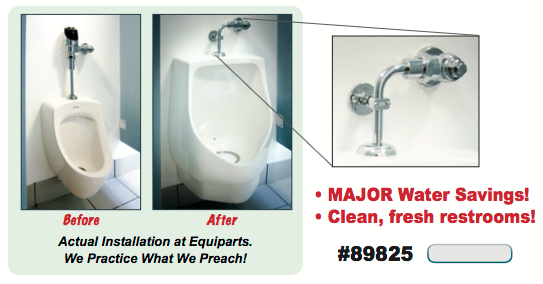 Prior to the Hybrid Urinal, Equiparts had an American Standard AllBrook Urinal installed. (The All Brook is very similar to the High-Efficiency Sloan Urinal, so these installation tips most likely apply to updating from that unit as well) The footprint of the AllBrook urinal was smaller than the footprint of the Sloan Hybrid urinal, which fortunately covered up any marks or indentations made by the AllBrook unit. The only item that needed adjusting was the height of the wall mounting bracket. 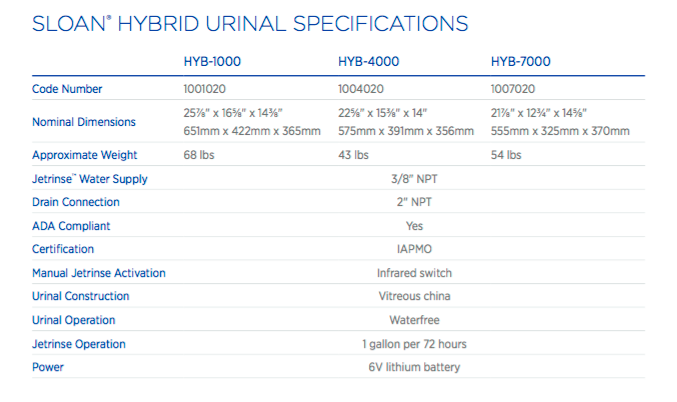 Find out more about the Sloan Hybrid Urinal, including pricing, bulk order discounts, or get a quote by calling one of our Equiparts product specialists: 800-442-6622 Monday-Friday, 7:30 AM-5:00 PM EST. Or download and share the Sloan Retrofit Hybrid Urinal PDF with colleagues or friends.